Figure B is a complex diagram that requires a detailed description, which is offered in this section. Think of this diagram as an energetic quadrant divided by two axes. The vertical (y) axis is the axis of dynamic emotions, whereas the horizontal (x) axis is the axis of stable emotions. If you have, for example, frequent mood swings, shifting from anger to love or sadness to joy, you are riding the “serpent” of the vertical axis. The serpent axis is aptly named since those who shift back and forth between the poles of Viral Negative and Viral Positive spring from side-to-side, seldom enjoying peace or contentment. It is much easier to shift between the quadrants one and two, or even quadrants three and four, than it is to shift between one and three, or four and two. 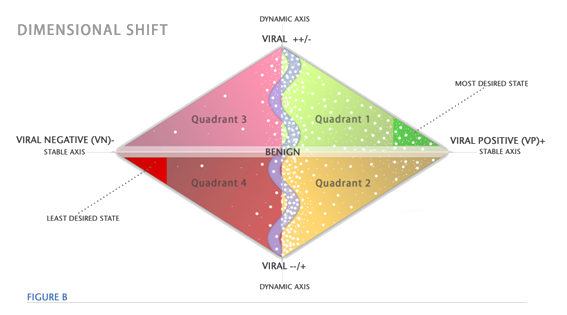 The hardest is the shift between quadrants four and one because they are so incompatible as to make the shifts physically painful. The movement we each take across this energetic quadrant can be random-reactive, or purposeful-empowered. For example, let’s say you are waiting in line at the grocery store and the person in front of you begins arguing with the clerk about the costs of several items, and you can’t help noticing that the line of customers behind you is growing. You have the option of riding the serpent and flashing angry glances at the customer ahead of you, while posturing with your body language in disapproval. Or, you can take a deep breath, inflow the light of your heart’s virtues, select the one you intuitively feel is most relevant to the situation at hand (perhaps understanding > forgiveness), and then release it to the event without condition or judgment. Riding the serpent you will tend to operate in the random-reactive mode. When you operate in the more stable fields of Viral Negative or Viral Positive, you tend to express a more purposeful-empowered perspective in your life moment-to-moment. Unfortunately, in the case of the Viral Negative person, the outcome is repressive to the human family, which leads me to an important point: unlike most psychology which defines the negative behaviors with words like lust, anger, or obsession; the Viral Negative state is simply defined as repressive to the human spirit. The majority of people ride the serpent unaware that there are people who purposely conspire to repress the human spirit, trying to keep us separated from one another, and to live unfulfilled lives relative to our spiritual purpose. These are the ones who live in the Least Desired State, operating with a purposeful-empowered mindset, at least partly focused on the repression of the human spirit. Of course, the irony is that the vast majority of those operating in the Least Desired State would identify their mission as one of saving humanity or protecting it from itself. This is all part of the conundrum of definitions. The Viral Positive person, living in the Most Desired State, is one who is purposeful-empowered in the context that they exude a liberating field or persona that empowers others to activate and express their spiritual purpose. There is no sense of repression or random reaction; it is a clear and coherent focus on helping others to live from their hearts and express the virtues therein. This energetic quadrant is a way of looking at the emotional terrain in which we express our energetic self. It is through this portal that our energetic output of the Individual Human Energetic Field (IHEF) is received into the Collective Human Energetic Field (CHEF), and our energetic fingerprint is fused to the human collective of energy. If we look at the energetic quadrant as our portal into the CHEF, then it becomes more obvious that we have a responsibility to establish our prevailing position in quadrant 1. Notice that I said prevailing position, not absolute. Everyone will cross lines from one quadrant to another. It is our natural and desirable state to cross boundaries and experience different points of the quadrant. However, we can choose which points become our prevailing or stable positions, from which we derive our identities and our perceptions of the external world. 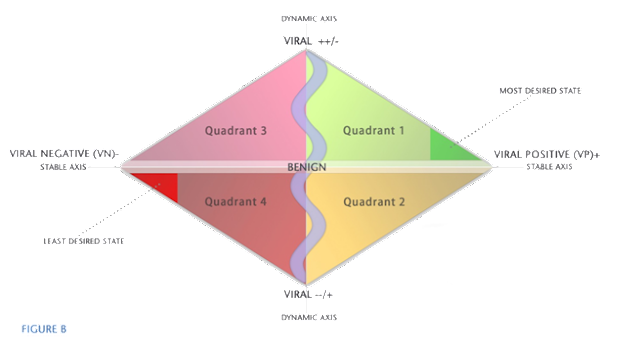 Reviewing the energetic quadrant, you have probably attempted to place yourself within it, and in doing so, you have found a point that is temporal—assignable today, but not necessarily tomorrow or next week. Further, you may have allotted some degree of judgment as to your “place” on the quadrant, as if it is your home or where you belong. Many of us have had past experiences that appear to lock us into a particular energetic expression that can feel like it is frozen in time. But that is untrue. You can pick any point on the quadrant and say, “This is where I am today.” And you can pick another and say, “This is where I choose to be tomorrow.” The distance between the two points can be measured in millimeters, but may seem like light years away from each other to your mind. The energetic signature we emit to the universe is composed of an energy so refined as to be undetectable to our senses, but it is the transformative rocket fuel that feeds our progression into the Most Desired State. This it can do independent of the dimension of time, past traumatic experiences, miserable upbringing, or any other rationale your mind can conjure. Perhaps you’re thinking, “But wait, don’t the emotions define my energetic field?” The emotions influence your energetic field, but its definition is one of intention and will. You choose the energetic equivalent of yourself, and keep choosing it every moment of your life on earth. You choose the energetic field that you emit to the universe. This is the seed of energy that you established or “planted” within the human “soil.” Like anything that evolves and transforms, this seed requires nurturing and cultivation. To the extent you express your heart’s virtues—practicing them in everyday situations—you will see your emotional state shaping your energetic field in such a way that you will awaken one day and the universe will become the mirror of your energetic body, and you will finally meet the inward self that embraces all. You can look at the quadrant as a stage with three different roles. The Viral Negative does not mean you are Satan incarnate or a miserable convict rotting away in prison. Most of the members of the human family who live in this state are seemingly responsible, polite, and attentive citizens of their respective countries; except for the fact they repress the human spirit and separate the human family into sexes, religions, races, preferences, colors, and segments of disintegration. They could be doctors, Sunday school teachers, librarians, policemen, mothers or business executives. There is no job or social standing that excludes them. What distinguishes them is that they are purposeful in their repression and separation, there is a cause behind their actions and this cause anchors them in the Viral Negative State (VNS). For purposes of this paper I will refer to these people as VNS People. In the middle section are those who are riding the serpent of the emotional swings tethered to the social undulations as meted out by the dominant cultures, religions, political, and educational systems. Since I am focused on the energetic field of a category of individuals within the human family, I’ll refer to these as Riding the Serpent (RTS) People. RTS People are the base of humanity, speaking energetically; they set the general pattern of how emotions and energetic frequencies of human interaction become the norm. They are mostly concerned with family, work, and entertainment, but they also dabble in the spiritual and are in different states of awakening relative to their energetic field. RTS People are in search mode, forever seeking whatever is felt to be missing in their life. They are disillusioned by the seeming indifference of their God, and this condition keeps them uncertain, which in turn makes them more reactive to life. If you are always reacting to the external environment and the uncertain impulses of your internal world dimly felt, you will tend to be dramatic in your swings of emotions and your IHEF will reflect this. RTS People have a prevailing feeling that there is more to life, that a higher purpose awaits their discovery if only they could find it. This adds to their sense of uncertainty and frustration, which only fuels their reactionary impulses when coupled to the rising stress of modern-day living. On the Viral Positive side of the energetic quadrant, people in this category, as they approach the Most Desired State, become increasingly aware of their energetic field in a similar way to how an infant becomes progressively more aware of its physical body. The Viral Positive State (VPS) People are not necessarily “spiritual” people in the sense that they are teachers within a religion, nor are they necessarily the scientists in search of the energetic realms. Unless a person, regardless of their stature in life, is also actively expressing their heart’s virtues and empowering others to do the same, they will never enter the Most Desired State, unless it is for a radiant moment as a means of activation—a calling to their soul from the Designing Force. Just as the VNS People are anchored in their energy field by the cause of repression and separation, the VPS People are anchored in their commitment to the human family by transcending the myopia of small picture dramas. Those within the Most Desired State have an unwavering commitment to the cause of human transformation from material-mindedness to energetic-heart-awareness. This is the cause that anchors them. A key to understanding the energetic quadrant is to see the VNS, RTS, and VPS People as members of the human family who are informing the collective energy, or CHEF. From a perspective of wholeness, there is no wrong or right, good or evil. All of us have a role to play in this vast collection of energy. However, the choice is still ours as to how we desire to work with the greater incoming energies impacting on our planet. This is an important distinction between the three primary groups of people because only the VPS People are able to transmit the incoming energies like a clear prism can transmit white light into seven rays. As it has been said, a prism in the dark is just a hunk of glass. So, too, is the human energetic field—in the dark it is just a receiver. If it is in the VNS or RTS state, then it is in a darkened state and the incoming energies from the universe at large (Designing Force) cannot transmit the energetic frequencies that empower and fuel the human family to transformation. Now, to be clear, I am painting with black and white for effect. Admittedly, there are many shades of gray, but the point is that in order to both receive and transmit the higher energetics of the universe—to have a positive effect on the human transformation objective—you must choose the path to become and remain a VPS Person. The when-which-how practice is a choice that immediately begins to shift our IHEF and align its trajectory to the Viral Positive state. The Most Desired State (green triangle in quadrant one) is the gravitational core of quadrants one and two, and it is the most potent position within the energetic quadrant as it pertains to influencing the CHEF. In other words, if you are able, as a result of your conscientious and deliberate application of the when-which-how practice, to operate within the Most Desired State, you are contributing a virally active energetic signature that can influence thousands of others who are also seeking a way to become Viral Positive, even though they may not consciously intend it. 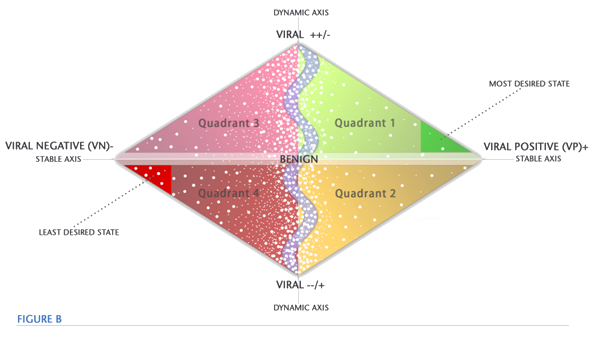 Another way to look at the quadrant is to imagine points of humanity on it (see below). Imagine that each large dot represents ten thousand IHEFs and each small dot represents one thousand. This view would represent the distribution of IHEFs into the CHEF. Let’s say this view was a snapshot of the CHEF, and that we could take pictures at different times and review how humanity is progressing relative to its CHEF. These snapshots would signify how humanity is evolving emotionally and energetically. In the example above, notice that the distribution of IHEFs is denser along the serpent’s axis. This would indicate that humanity, as a whole, is fluctuating between quadrants and operating in a more reactive behavior to life’s events. You can also notice that there is more distribution of IHEFs in quadrants 3 and 4, indicating that the Viral Negative—particularly in the Least Desired State—is generating a more effective influence. There is much written and discussed about the impending dimensional shift. 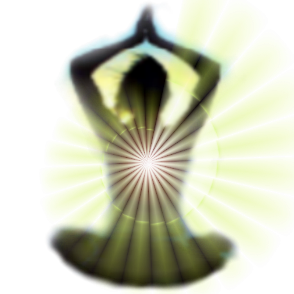 While it has many facets, the real shift occurs energetically across the human family. It could look like the view below, if enough people learn how to express the six heart virtues with a degree of consistency. As a result, the “dots” within the Most Desired State will increase and a shift of balance, energetically, can occur within the broader human family. From the time you make the decision to practice the six heart virtues—to live from your heart—you are re-gridding your energetic signature in resonance with quadrant one and the Most Desired State. You are part of the shift of consciousness upon earth, and as you move closer to the Most Desired State, you are not only part of the shift, you are an activating force of the shift. 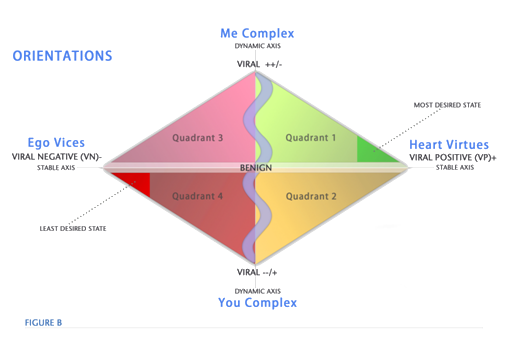 As the diagram above shows, our personal path can be organized into four orientations that overlay the energetic quadrant, and be used as a practical guide. These four orientations consist of the three tendencies of the mind: Ego Vices, You Complex, and Me Complex (definitions to follow), and the one affinity of the heart: Heart Virtues. While very general, these orientations superimpose another dimension of structure to the energetic quadrant. Normally, as we develop in one lifetime, and even through the macro-lens of multiple lifetimes, we journey through the quadrant of Ego Vices, which has a decidedly selfish orientation. We then move to the You Complex where our attention is on the shortfalls of the external world, which could include family, friends, work, or society in general. Next, presuming a sequential trajectory, we would spend time in the Me Complex, which is the quadrant where we first begin to recognize that our inner self is fundamental to our happiness and sense of well-being. Finally, we enter the Heart Virtues, where we begin to shift our focus from the mind’s comprehension of truth and the seeking of enlightenment, to the more active practice of expressing our heart’s virtues and energetics therein. Many of us bounce from quadrant to quadrant within a single lifetime, and to be clear, there is no set sequence. In other words, as a child, one can live in the Heart Virtues quadrant, and by the age of seven, move to explore the You Complex. Later in life, when a young adult, they live squarely in the Ego Vices quadrant. When they reach thirty years of age, they can shift to the Me Complex, and then, because of a shattering experience, fall back to the You Complex. Finally, at the age of forty-five, they return to the Me Complex, and something in their inner search rekindles their practice and expression of the Heart Virtues, not as a random emotion, but as the core practice that brings meaning to their life. This is just an example of how each of us journeys through these different quadrants and lives in them, largely unaware that they shape, in an important way, our IHEF contribution and the meaningfulness of our life. The energetic quadrant is a framework to help you assess your prevailing position and IHEF contribution. You can do quick mental check-ins to sense your position within the quadrant, and sometimes, to even assess the human family as a whole. This is not an exercise in judgment (You Complex), but rather a framework to enable an intuitive check-in of your energetic progress. From separation—with practice—comes the prevailing sense of unity. When you first practice living from the heart, you might feel awkwardness, separation, and disbelief, but these are temporal states, and they will, if you persist in your practice, be replaced by competency, unity, and evidence.